Abusive relationships can be described as verbal abuse, physical abuse, mental abuse, threats, lies, extreme jealousy, power plays, control games, and sexual abuse. One or more of these characteristics in a relationship define an abusive relationship. Here are some links to sites with more information on abusive relationships and organizations deemed to help end domestic violence and sexual assault against women. What happened to me doesn't have to happen to you. 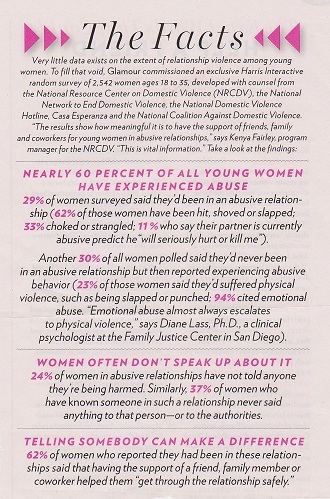 Please get help if you are in an abusive situation.